Amy Adams can brighten up the room, or at least light up the screen, which is what she does in this bigger and more colourful sequel to the 2006 hit. She plays a sassy 30s film star version of Amelia Earhart, busting at the seams with her love of flying and sense of adventure. She also has an impetuous crush on the hero, Larry Daley (Ben Stiller), whom she is helping navigate, this time, through the Smithsonian museums in Washington D.C. The first Night at the Museum worked beautifully as an advertisement for the American Museum of Natural History, and this seems destined to do the same for the National Air and Space Museum and the National Gallery of Art. It had to be this way, since without it the filmmakers would never have received permission to film in the real locations. Think of it as the Top Gun for museums. We find Larry having left his life as a night guard behind and instead running a successful infomerical business. Smartly dressed and cruising around in a chauffeured vehicle, he heads back for a visit his old haunt on Central Park West. He discovers that his old friends, including Owen Wilson as Jedediah and Steve Coogan as Roman Emperor Octavius, are to be transported to storage in the Federal Archives underneath the National Mall in D.C. Robin Williams' Teddy Roosevelt is to be left behind, presumably because Williams wasn't keen on the sequel. It's for the best since Larry encounters far more engaging characters on his subsequent rescue mission. They include Adams' aforementioned Amelia and Hank Azaria, channeling Boris Karloff, as the evil Pharaoh Kahmunrah. Kahmunrah plans to open the gates the underworld so he can rule the Earth (or something). He is aided by the womanizing Napoleon, plain confused Ivan the Terrible and a young, black and white Al Capone, who inexplicably never gets to fire his Tommy gun. Maybe that was a clause in the filmmakers' Smithsonian contract. Like many high-budget sequels, the number of characters and ideas flattens the narrative, but many of those are so exuberant it hardly matters. A visit to the Lincoln memorial, flying the Wright flyer inside the Air and Space Museum and, best of all, jumping into the famous Alfred Eisenstaedt photo of a sailor kissing a nurse on V-J day in Times Square, 1945, flash by one after another. Larry's character arc is predictable, and the message to kids that they should "do what they find fun" is obvious, but it's affable and inoffensive. It sits more comfortably than the occasional lapses into juvenile humour, which will amuse only the most undemanding kids. The Blu-ray release is superb and heavy on special features. There are two commentary tracks, one by director Shawn Levy and another from the writers, Ben Garant and Thomas Lennon. There are twelve featurettes, the best of which is a twenty minute "A Day in the Life of Director/Producer Shawn Levy", which follows him on a particularly effects-heavy day of shooting, and is a great insight into the day-to-day process of creating a big-budget feature. There's also over half an hour of deleted scenes, many which are alternative versions of scenes in the film with different improvisations, and a gag reel mainly featuring Azaria and Ricky Gervais, who plays the original museum's director. 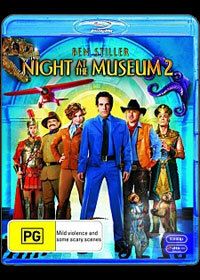 Night at the Museum 2 is unashamably an ungainly, unsophisticated big budget effects-laden Hollywood production with an obvious agenda. If you are willing to accept that premise - and who am I to fault those encouraging young people to be interested in history - then it delivers what it promises. If not, then see it for Amy Adams. She's postively phosphorescent. This is a new disc and may require a firmware upgrade on some older players.